Electronic scales are common today, and many of them easily interface to PCs. However, for most commercial shipping services, the weight alone isn't enough, they also want to know the physical dimensions of the package.While you can get the weight directly from the scale, measurements are still done by hand with a measuring tape or yardstick. In a high volume shipping room with many different package sizes, measuring and recording the package dimensions adds several steps to the shipping process. Weasure offers a "one-touch" solution to this problem. 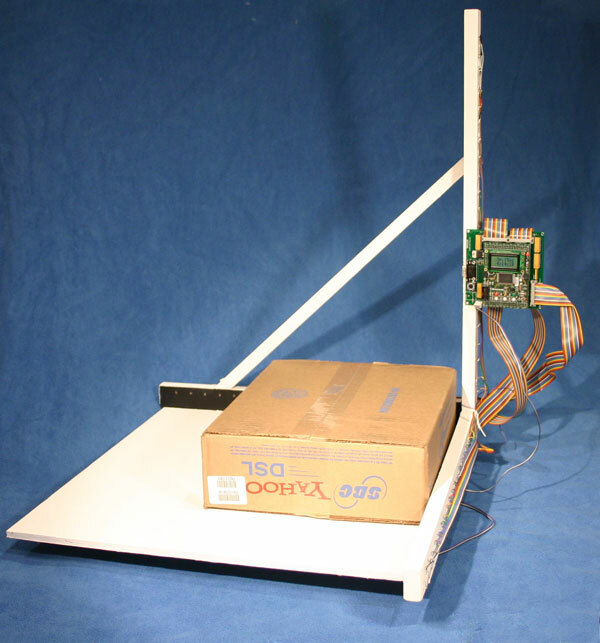 Simply place the package on Weasure and both the weight and dimensions are instantly displayed. By connecting Weasure to a PC's serial port, this data is uploaded directly to the PC, where a shipping application can send the measurements directly to the shipping company's web site, further streamlining the process. I was all set to run to the patent office with this idea, but some research on the field (known as "dimensioners" in the shipping trade) turned up the Mettler Toledo CS5400, a very similar design. It's one of the most useful gadgets I've built - I use it every time I ship a box. 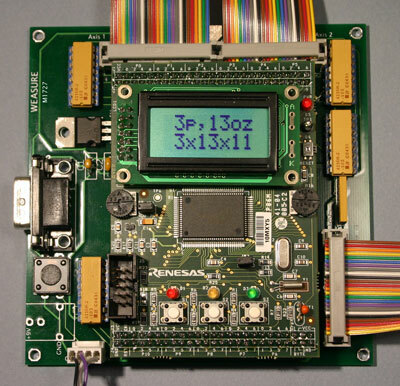 The project won second place in the Renesas M16C Design Contest. A detailed description of how it works can be found here [PDF 390K] or the article published in the June 2006 issue of Circuit Cellar.